Do you want to speed up your WordPress site? Website loading speed is very important for any blog or website. If the loading speed of your site is not good, the visitor will immediately exit from your site. In addition, Google uses the page speed as a ranking factor, which means faster loading website gets better rank in the search result. Today, in this article, I will tell you how to improve WordPress website loading speed. Why is Website Loading Speed Important? Website speed can make any site successful or break. It greatly affects your traffic, Pageviews, conversions, sale and reputation. And as I said already, Page Speed is a ranking factor. When Google ranks a page, it uses a number of factors, one of which is page speed. If your website loads fast, then it will rank well in the search engine. Because Google likes fast loading site more. As a result, when your site ranks well in the search engine, then obviously you will get more traffic. Website loading does not only increase your website traffic and ranking. It provides a good user experience to your visitors. A good user experience increases the number of visitors to your site and helps in becoming a reputed brand. There are lots of tools in the market to check website loading speed. But I recommend that you use PageSpeed Insights, Pingdom and GTmetrix tools. PageSpeed Insights – PageSpeed Insights is a very good speed testing tool created by Google. With this help, you can check the speed of your website and find out the errors. Just, you have to visit the Pagespeed insights site then enter your blog URL and click the Analyze button. This will take some time to analyze your website and gives a great overview. GTMetrix – GTMetrix is also a great tool that helps to check website load time and performance. It analyzes your website loading speed and shows the errors that you should fix. Apart from this, if you register it, you can also check your website load time on the basis of the server region. Pingdom – Like GTMetrix, Pingdom is another great tool. Just, enter your URL. It gives a very good overview of the website speed. It also tells which elements in your page are taking longer to load. When you check your website speed, it recommends you to fix a lot of things. Some of them are technical that most bloggers do not understand. Here I am going to tell you about some reasons that cause your website to slow down. Webhoting – If you do not select the right host for your site, it greatly influences your site load time. Caching – If your site is unable to create a cache properly, your site may be slow down. Page Size – This issue is mostly due to the images. When you add the image to your page without optimizing, your page size increases and causes your site to slow down. External Script – This problem is usually caused by ads, fonts loaders, etc. and affects your site performance badly. These are some of the basic reasons that can slow down your WordPress site. If you publish quality content on your site or blog but your website does not load faster then you can not get a higher rank in Google search result. So here we will tell you some killer tips which help to speed up your WordPress site. This is the most important and first aspect to increase website loading speed. There are many hosting companies that promise to provide fast loading to your WordPress website but after buying the hosting from them, you feel that they have cheated and your hosting expenses have gone waste. Therefore, I recommend Bluehost which offers good service at a low price. Apart from this, it gives free a Domain for one year. It is also recommended by official wordpress.org. Here I have listed 8 Best WordPress Hosting Services that you can use. 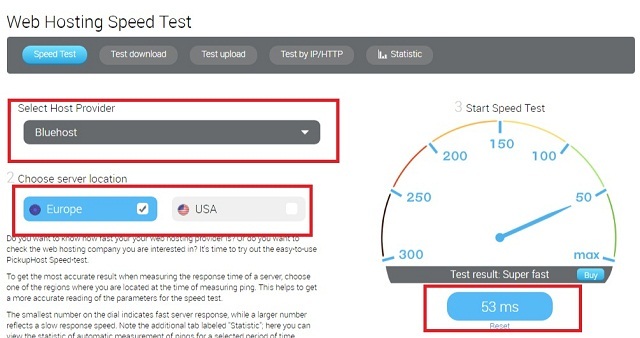 In addition, if you have a doubt on a hosting company, you can use Pickuphost to check the hosting speed. You just have to select your hosting name from the drop-down menu. Then select your server location and click on the Speed test button. This is the second most important aspect to speed up your WordPress site. There are many such WordPress themes that come with beautiful and impressive-looking, but their coding is very bad and it badly affects your website loading speed and performance. So always select a simple and Well coded theme for your site. Here I have listed some of the best free and premium fast loading WordPress themes. You can install premium themes from Mythemshop, Themeforest and StudioPress that are well coded and optimized for speed. But if your budget is low, then use free themes like GeneratePress or AstraTheme. Plugins work as an app on your WordPress site, which increases site functionality. But if you use more plugin on your site then it greatly affects your website loading speed. So delete unwanted plugins on your site that are useless. Furthermore, delete unwanted media and inactive themes that are useless on your site because unwanted media takes extra space on your WordPress site and increase your WordPress database size. Note: Inactive plugins and themes can create security vulnerabilities and can also affect your WordPress site performance. You can greatly reduce web page size by compressing images and get better speed and performance. There are many image optimization plugins available in the WordPress repository, in which you have to choose the best image optimization plugin. Here we have listed some of the Best Image Optimizer WordPress Plugins, which you can use on your website. When you upload images to your website, Image optimizer plugins automatically reduces the size of images by compressing and make your site faster. GZIP Compression compress your webpage size so that your site loads fast in visitor’s device. You can download a good plugin from WordPress.org to compress your WordPress site’s resources. Although there are two most popular caching plugins that allow you to enable GZIP compression – WP Rocket and W3 Total Cache. You can use the Check GZIP compression tool to check GZIP compression on your site. Content Delivery Networks serve content based on users’ geographic location. When you use a CDN service, it creates a static cache of your site and stores on own servers. Now when a user accesses your site, content delivery network redirects them to the nearest server. For example, if your server is in India and a visitor accesses your site from the US then CDN will redirect that visitor to US server. Make your WordPress site faster. Protects Your Site From Crash. PHP 7 also speed up your WordPress site and make more secure. It comes with many improvements that directly benefit to your WordPress website. WordPress.org always recommends users to use the latest version of PHP for better security and performance. You can upgrade it in a minute by going to web hosting cPanel. If you have trouble upgrading to PHP 7, you can contact the hosting provider. WordPress cache plugins generate static HTML files for your site and when a user accesses a page on your site, it replaces heavier PHP scripts with static HTML files which makes your site faster. The Cache plugin helps you get rid of slow loading and improve user experience and the search rankings. If you use shared hosting for your WordPress blog, then I recommend that you use the WP Super Cache plugin. This helps to speed up your WordPress site with very little configuration. WordPress sites use databases to store all information in it. If you do not optimize the WordPress site’s database timely, it can affect your website load time. There are too many plugins available in WordPress to optimize the database. We use the WP-Optimize plugin to optimize databases on our blog. Furthermore, do not forget to remove the unwanted table from your database. Compared to anything other things, the image takes a lot of time to load and if you add many images to your article, it increases your page load time. In this situation, Lazy load plugins help to improve your site performance and web page loading speed. Lazy loading only loads images that will appear on the user’s screen. In simple words, when a user scrolls your website page, your website loads images. It significantly improves the loading speed of your website and also saves bandwidth. Hotlinking can slow down your site even after image compression. There are lots of bloggers who know very well about Image Hotlinking, but they do not care. They copy and paste the image URL of your site to own site. As a result when a visitor browses the hot-linked image site, then this (hot-linked image) is loaded with the original server. Suppose when a high traffic site hotlinking your images, all image requests will be processed by your server, which can slow down your site. It is very important, WordPress is updated frequently. Not every update gives you only new features but also fixes security issues and bugs. So it is very important that you keep your site, plugin and theme updated. If you do not do this, it can cause your site to slow down and security vulnerabilities. If you use high-quality featured images for your post, then the users will need more time to load your homepage. As you can see, I also use five posts for my blog’s homepage. If you want to reduce the number of posts on your homepage, just click on Settings >> Reading option. Here you will see an option in “Blog pages show at most”. In it, you can enter any number, less than the default. I recommend showing you 5 posts on the homepage. By default, WordPress homepage and archives page displays full content. So your homepage, categories, tag and other archives pages load slowly. It also affects the user experience. If you are using a default theme, which is showing full content instead of showing the content in Excerpt, you can easily fix it by using the Advanced Excerpt plugin. If you have lots of ads on your site, it will badly affect your page speed. Also, it is not good for the user experience. I do not say that you do not use ads on your site, you serve them in the right place and do not serve more ads on your site. If your site is receiving a lot of comments, then it’s a great deal. But do you know this affects your site performance? But do not worry, you can fix it easily by breaking the comment in pages. Just, login in your WordPress site. Then click on Settings >> Discussion and check “Break comments in pages” option. Here I have told you the best way to make WordPress site faster. If you follow this article to speed up your WordPress site, then I promise that you will get better results. And one thing, your website loading speed should be within 3 seconds to get a good rank in the search result and for better user experience. Fast loading website achieves a high ranking in SERPs. If I have missed any strategy to improve WordPress website loading speed, let me know by leaving a comment below.